"Die Nelken brauchen jetzt Wasser"
Klaus Staeck (b. 1938) is a social activist and graphic designer who trained as a lawyer in Germany. Constant themes in his poster art are social justice, free speech and political honesty. Over the years, the prolific Staeck has produced many controversial examples of agitprop - some landing him in German courts. Though addressing many complex political issues facing our contemporary existence, Klaus Staeck relies on simple visual motifs which incorporate the use of photomontage. 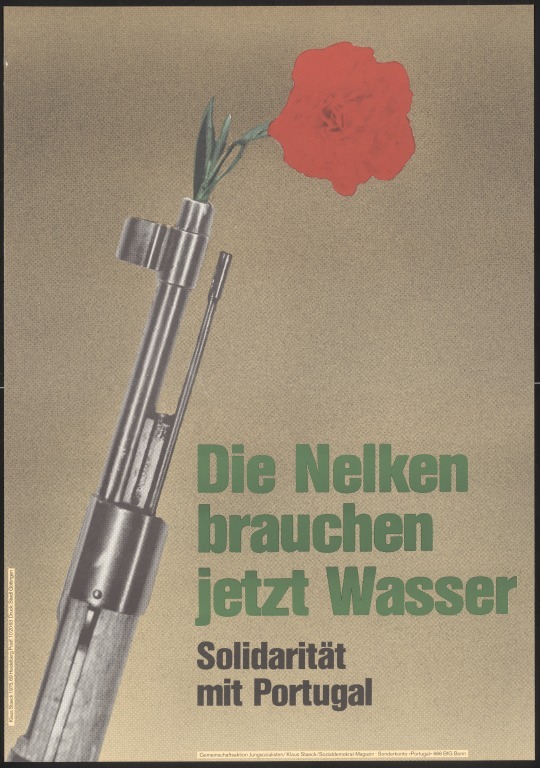 The image of a red carnation in a gun barrel is the symbol of peaceful resistance in Portugal: in 1974 (the year beofre this poster was published), a non-violent protest by Portugese civilians and dissenting soldiers alike resulted in the formation of a parliamentary democracy. Red carnation in the barrel of a rifle. 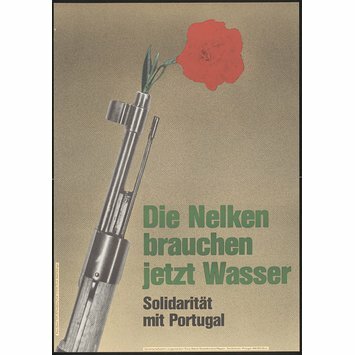 Solidarity with Portugal poster by Klaus Staeck. Germany, 1975.